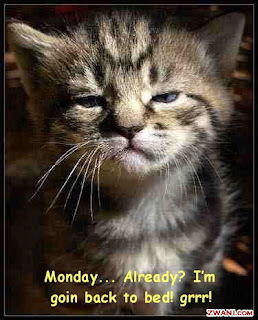 Well, here we are at Monday again. Mondays are busy, stressful days for a lot of people. They used to be for me, so I totally understand the dreaded Monday mentality. All you working, busy people out there have my pity. (The picture was a cheezy joke for all of you. So was spelling it "cheezy" instead of "cheesy.") But since the big O was born and we've just been chilling at home together all day, Mondays are just... Mondays. So far this morning I've been poking around looking at blogs and now the big O is just hanging out in her bouncer and sucking her thumb. I think she's getting sleepy, so I'm gonna go lay her down real quick. Just a sec. Okay. I'm back. Anyway, Mondays are just generally pretty slow, easy days around here. Well, for me and the big O anyway. Bryan has class and work and a test to take. Sorry Bry! Good luck! But at this point, the thing I'm trying to decide is what I should do today. I kind of feel like sewing, but kind of not. In other words, I'd feel a lot more like sewing if I didn't have to lug the machine and all of my supplies out from the back closets and set up shop on the kitchen table, forfeiting my nice, (fairly) clean table and front room. I think Bryan hears me dreaming about a craft/sewing room in our "someday" house at least once a week. It would be a lot more than once a week if I already had one because then I would be sewing a lot more. I just hate the mess it makes on the kitchen table. But before I can even get to something like sewing, I still need to eat breakfast and read scriptures, get dressed for the day (I'm still in my pjs), and probably by the time I get all that done, it will be time to go on our walk with Sarah and Elsie. Then when we get home I'll be thinking about lunch. And feeding the big O a few times in between all that. Sorry, I just left you again for a minute. I needed to use the restroom and then I got distracted reading an article in the Smithsonian about a teenager who was deciding between being in a gang or being an artist. I haven't finished the article yet, but I'm pretty sure he went with being an artist since I don't think the Smithsonian publishes articles about kids who ultimately decide to go down the path of bloody gang warfare. See? This is why I sometimes get nothing done during the day. Or have a hard time even deciding what to do. With a little one around, my day gets filled up with so many little things. As I've been writing this choppy post I laughingly thought to myself that my days fill up just by eating breakfast and reading scriptures and going on walks and feeding the big O and eating lunch and so on and so on and how could anyone even have time for a job? That, of course, reminded me of the beginning of the movie About A Boy (one of my favorites, by the way) where Hugh Grant's character just lives off the royalties of a song his father wrote and basically does nothing except watch TV and get his hair "professionally disheveled." He says, at the beginning of the movie, that it's easy to fill up a day if you think of time in units of about a half hour. I think, however, that with a baby around my day quickly fills up in units of about five or ten minutes. Anyway, if you think of anything great for me to do today, let me know. For now, I'm off to eat breakfast. Happy Monday! My day is a lot different from yours, but who's to say that you're not more productive in the ultimate scheme of things? Man, you're day sounds a lot nicer than mine. hehe you crack me up. I usually think of time as...how to occupy sadie for the longest time possible? and how to keep her happy? i don't mind mondays either...they're fun for us cause we have play date! I'll have to rent About A Boy...never seen it! Thanks so much for the cloth diaper help and excitement! I'm glad to have a little input, I can use it all!